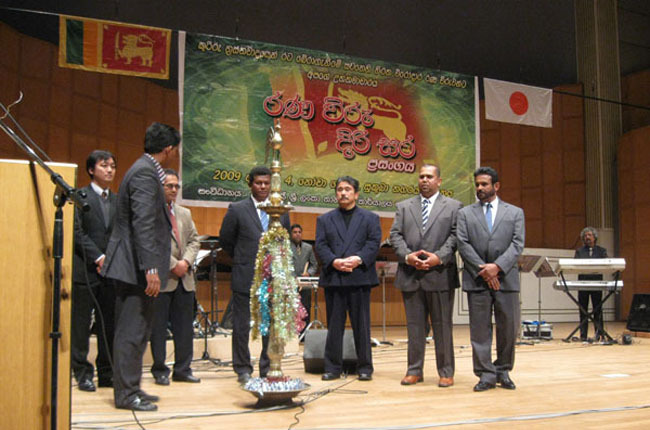 The Embassy of Sri Lanka in Japan in collaboration with Sri Lanka Association in Japan organized a cultural/musical programme in support of welfare of the families of the armed forces. The event was held at Nova Hall in Tsukuba City on 4th January 2009. Over 1200 Sri Lankans attended the event. Well known artistes from Sri Lanka were flown by courtesy of SriLankan Airlines to perform at the event. It was possible to raise a donation of Rs 4 million from this event which will be channeled to an appropriate relevant welfare institution in Sri Lanka. The Sri Lanka Business Council in Japan, Sri Lanka Students Council in Japan, Sri Lankan business entrepreneurs and individuals extended their fullest support in organizing the event. His Excellency President Mahinda Rajapaksa had conveyed a special message of felicitation for the success of the event. The total donation of �2012 received from supporters and sponsors at the Sky High Musical night was presented to H.E. the High Commissioner Justice Nihal Jayasinghe by Manjula Munasinghe of Sky High Band and Saliya Ekanayake of Haydon School on 16 December at 4.30pm. The High Commissioner thanked all the organisers and Sky High Band for their commitment to the Api Wenuwen Api UK programme. Main sponsor, Kapila Jayasena, and organisers Chanaka Dissanayake and Dushmantha Wijekoon were also present. Defence Advisor Brigadier Prasad Samarasinghe was unable to attend due to an official visit abroad. The musical night organised by Sky High Band and Saliya Ekanayake of Haydon School was a colorful evening for lovers of the Motherland Sri Lanka.on Saturday 29 November. Hosted by Chanaka Dissanayake, the night was a spectacular feast of musical and dance entertainment. Dr Handru Palpita Mahinda Thera from Kingsbury temple initiated the programme with Seth Shanthi and Chief Guest HE High Commisioner Justice Nihal Jayasinghe, Dr Handru Palpita Mahinda Thera, Brigadier Prasad Samarasinghe, Manjula Munasinghe from Sky High band, Saliya Ekanayake and Wayne Milson from Haydon School lit the traditional oil lamp. HE High Commissioner Justice Nihal Jayasinghe and Brigadier Prasad Samarasinghe thanked all those present and those involved for their dedication and effort in supporting the Api Wenuwen Api UK campaign. Brigadier Prasad Samarasinghe was awarded an engraved plaque in recognition of his dedicated services and contribution to Api wenuwen Api campaign in UK, by Sky High band and the Api wenuwen Api UK organising committee. Sky High band, who have supported the Api wenuwen Api UK project in many ways organised this event in support of Api wenuwen Api UK. The band thrilled the audience with a medley of disco, rock, hindi and Sri Lankan, baila music. Top Sri Lankan fashion designer Chula Nanayakkara Ariyaratna, showcased her personally hand crafted sarees to a fascinated audience, including beautifully ornamented and hand embroidered traditional Kandyan Nilame and Kandyan groom costumes. A short documentary video of the Ranajayapura housing project constructed under the Api wenuwen Api project showed those present the final destination of their heartfelt donations. The revelry and merriment went on until the early hours of the morning. The raffle draw saw a lavish award of fabulous prizes donated by Comtech Logic Ltd. The night ended with Api Okkoma Rajawaru song and the Sri Lankan national anthem. Proceeds from this event will be donated to Api Wenuwen Api housing project at Sri Lanka High Commission. A special "Remembrance and Thanksgiving" service for those of the Sri Lankan Armed Forces who have died in past and present wars and for those currently fighting to defeat terrorism, was held at The Parish of St. Mary Magdalen, Peter Avenue, Willesden Green, London on 29th November at 2.30pm. The guest of honour was Sri Lanka UK High Commissioner H.E. Justice Nihal Jayasinghe and Mrs Jayasinghe. sponsorship, for the consignment of donated items to be shipped to Sri Lanka. Defence adviser Brigadier Prasad Samarasingha was also present. �Api Wenuwen Api� UK Programme a Great Success. 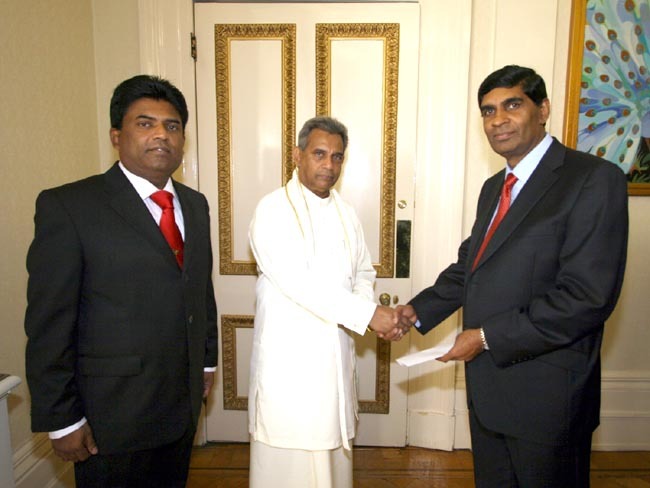 High Commissioner Justice Nihal Jayasinghe at the presentation of the final accounts relating to �Api Wenuwen Api' UK programme by the organising committee on 7th November 2008 at the High Commission said that the promotional events conducted in the UK in September 2008 had met with tremendous success. Brigadier Prasad Samarasinghe presented the final accounts in the presence of the committee members who worked with high level of commitment in making the project a resounding success. The UK programme has netted a record profit of UK Pounds 94,108.00 towards the service personnel housing project, which according to observers a remarkable achievement. �Api Wenuwen Api� is a project initiated by the Ministry of Defence dedicated for providing much needed housing facilities for both serving and disabled service personnel of the armed forces in Sri Lanka in appreciation of their services to the Motherland. The High Commissioner further said that he would like to take that opportunity to extend his sincere appreciation to all the Sri Lankans who rose to the occasion and made generous contribution towards the �Api Wenuwen Api� fund raising programme demonstrating their patriotism and concern for the service personnel. Bank of Ceylon Sponsors Api Wenuwen Api UK. Thank You - You made it a reality. We would like to thank all who helped the Api Wenuwen Api � UK campaign to raise funds to build houses for the deserving Tri-Services Personnel of Sri Lanka. Your dedication, time, effort, contribution and commitment made the three Cultural and Musical Shows in London, Birmingham, Manchester a reality. The support given by the Sinhala, Tamil, Muslim, Burgher and other communities in UK in supporting this worthy cause shows the unity that makes us proud to be Sri Lankans. Your support has and will make a difference to the Tri-Services Personnel for years to come. Your continued support will help us express our appreciation to the brave men and women who work to bring peace and protect the sovereignty of Sri Lanka.